The United States is working to set up a second summit between President Donald Trump and North Korean leader Kim Jong Un, but there is still work to do "to make sure conditions are right," U.S. Secretary of State Mike Pompeo said on Friday. “We’re working on it. But there’s still a little bit of work to do left to make sure the conditions are right and that the two leaders are put in a position where we can make substantial progress,” Pompeo told Fox News in an interview. Pompeo told NBC News in a separate interview that he hoped the meeting could take place "before too long," and that he hoped he himself would get a chance to travel to Pyongyang again to negotiate before that. But he said international sanctions would have to remain on North Korea until it gave up its nuclear weapons, which are a threat to the United States. "Ultimately, that’ll be a decision for the president," Pompeo said of a second summit between Kim and Trump to follow on from their unprecedented June 12 meeting in Singapore. "I’m hopeful that I’ll get a chance to travel again to Pyongyang to continue to negotiate before too long," Pompeo said. "And then before too long – and in relatively short order - I hope the two leaders get together again to continue to make progress on this incredible, important issue for the entire world." Pompeo added to NBC that important steps had been taken at a summit between the two Koreas this week and that while much more worked needed to be done, the United States had the "patience and determination" to achieve its aim. Referring to sanctions, Pompeo said: "Those economic sanctions will remain in place until we get to the end, till we get to that final denuclearization, which Chairman Kim promised President Trump he would undertake." South Korea President Moon Jae-in said after meeting Kim this week that the North Korean leader wanted a second summit with Trump to hasten denuclearization, but a key goal was declaring an end this year to the 1950-53 Korean War, which halted with an armistice, not a peace treaty. Pompeo said on Wednesday he had invited North Korea's foreign minister to meet on the sidelines of the United Nations General Assembly in New York next week and other Pyongyang officials to Vienna for talks with U.S. nuclear envoy Stephen Biegun. Asked on Thursday if those meetings would take place, U.S. State Department spokeswoman Heather Nauert said invitations had been sent and added: "We certainly stand ready to meet if they are able to." Moon said he and Kim spent most of a three-day summit discussing how to break an impasse and restart nuclear talks between Pyongyang and Washington, which are at odds over which should come first - denuclearization or ending the war and sanctions. 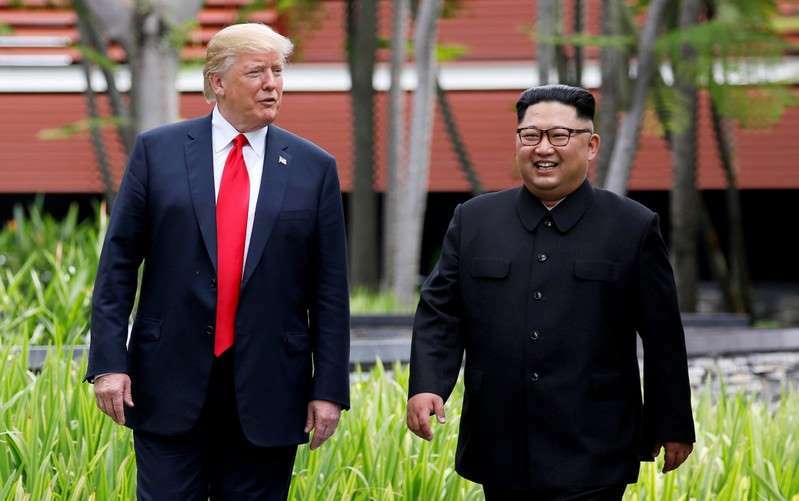 Kim, who recently proposed another summit with Trump, said after the summit that North Korea was willing to "permanently dismantle" key missile facilities in the presence of outside experts, and also its Yongbyon nuclear complex, if the United States took unspecified corresponding action. Kim pledged to work toward the "complete denuclearization of the Korean peninsula" during two earlier meetings with Moon and his encounter with Trump, but follow-up negotiations on how to implement the vague commitments have since faltered. Washington has called for concrete action and has demanded full disclosure of North Korea's nuclear and missile facilities before satisfying Pyongyang's key demands.